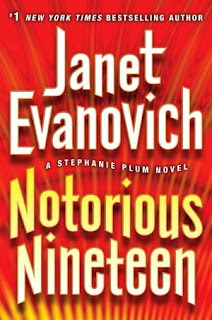 Goodreads description--#1 bestselling author Janet Evanovich’s Stephanie Plum novels are: “irresistible” (Houston Chronicle), “stunning” (Booklist), “outrageous” (Publishers Weekly), “brilliantly evocative” (The Denver Post), and “making trouble and winning hearts” (USA Today). Let's see. First off, I don't expect too much out of these novels. They're fun and playful. And typically, really quick reads. But there are a few things that I've come to expect from them, and the main thing I expect is laughing out loud. I was slightly disappointed with Explosive Eighteen, and still left wanting with Notorious Nineteen. 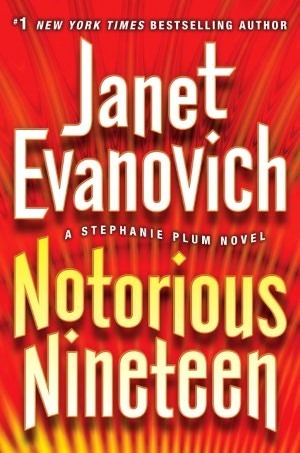 There were a few moments at the very tale-end of Notorious Nineteen that had me smiling because they were funny, but not giggling or chuckling and definitely not belly laughing that I've gotten from Janet Evanovich before. So that was a minor let down. I will say that modern day references in a book is a slight pet peeve of mine. One is okay, but almost any more than that and it just becomes too much. In this case, I loved the GOT reference, but when she moved into Pinterest and Biggest Loser references, it just became too much. Also, as anyone who reads these books knows, there isn't much advance in the storyline that spans all of the books--the relationship Stephanie has with these two incredibly hot guys, Ranger and Morelli. So that's always a bit disappointing. Whenever there is movement, I jump for joy. Notorious Nineteen, and the last two other books at least, held promise of movement and change ahead, but have yet to deliver on this promise. At this point, I truly think I'd be satisfied with Stephanie choosing either guy. The point is, and I think most everyone feels this way, just finally choose one. PLEASE! I completely understand the tactic of denying the audience what they want in order to maintain interest, but twenty-ish books is a lot of dangling the prize in front of our faces. And at some point, too much of a good thing is no longer a good thing. Don't get me wrong, I'm not fed up with these books exactly, but the frustration is starting to build some. Too much more of the indecision, and I will be fed up though. Because I can't help but share some of my favorite quotes from Lula...(*these are probably paraphrases since I listen to the audiobook, it's not like I have a transcript). "I've got peep toe shoes on and my big toe could look like a snack." Stephanie - "He's a little gassy. "Lula - "Yeah, we all relate to that." "I might even be getting diarrhea too." Notorious Nineteen gets 3 stars from me. Have you read Notorious Nineteen? If so, what did you think? Let me know! I haven't. I have officially stopped reading Stephanie Plum. Eighteen did me in. I, too, was disappointed with 19. It felt like a "filler" book to keep us waiting for Ms. Evanovich to close the series. It's kind of a catch 22. I always look forward to the next book, but I feel like she may be dragging it out a little too long now. I am not a big fan of her Diesel series though. We'll see what 20 has to offer. I still love Stephanie Plum and Janet Evanovich. They are old friends who I would miss hearing from once in a while. I do agree that sometimes they aren't delivering as I wish they would, but I will still keep reading for now.